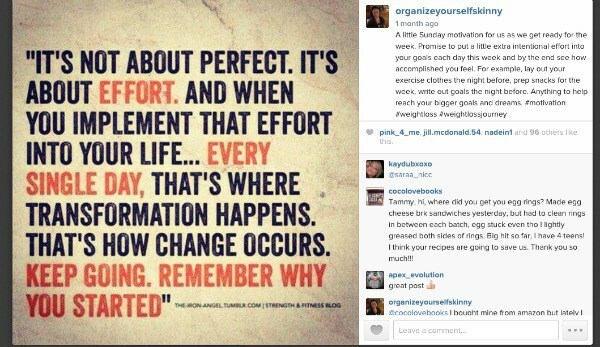 Instagram is a great way to hold yourself accountable and track progress as you move through your weight loss journey. It is much easier to keep yourself on track when others are watching, taking notice, and supporting you. 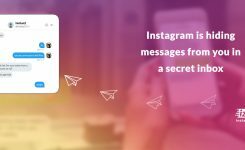 Instagram is free and easy to sign up. You can start posting pictures within seconds. Instagram is visual. Everyone loves pictures. It is a great way to tell your story and track your journey. Instagram is quick and mobile. Pictures are shared right from your phone. They don’t need to be perfectly edited. Nope, in fact, people love and expect to see real-time photos of your life. Instagram is personal. People get to know you and your journey through the photos you share. They see your struggles and triumphs. They see themselves in you. Accountability is king and queen when it comes to losing weight. The people I follow on Instagram post their food, food journals, running/exercise efforts, and anything else that helps keep them accountable. Trust me you will think twice about eating that extra serving or snack if you need to take a picture and post it for everyone to see. This helps to keep you intentional and mindful of food instead of eating without thinking. Weight loss is a slow process. It’s easy to want to see big changes immediately. With posting pictures of your journey on Instagram you begin to celebrate the small moments and accomplishments instead of always focusing on the final results. Instagram helps you fall in love with the process. That love is what keeps you going. This is so important and makes a huge difference as you begin and move through your weight loss journey. Posting pictures on Instagram, along with your thoughts, gives you to opportunity look back on your journey and see how far you have come. I always say, “it never gets easier, you only get better”. When you have pictures you can see this saying come to life. Nothing is more rewarding and encouraging that seeing the results of your hard work. 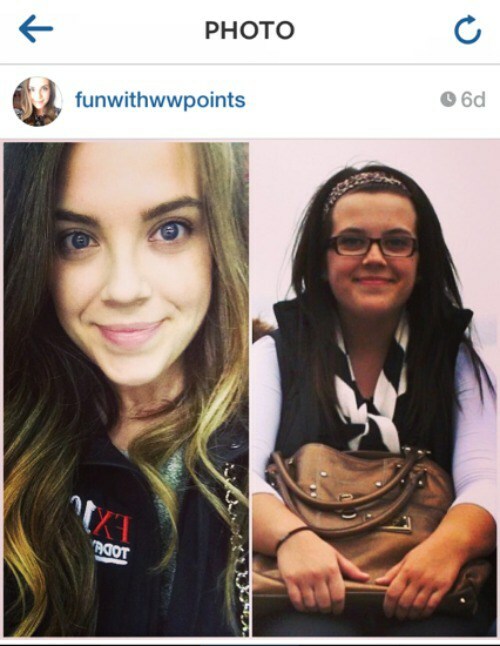 My favorite posts on Instagram are the #transformationtuesday posts. This is when people post before and after pictures. Some are so incredibly motivational. I also love the weigh-in posts too. People post these on all different days but you can find a bunch by searching these hashtags #weighin #weeklyweighin #wednesdayweighins I started posting my weigh-ins, on my blog, a couple years ago. This made a huge difference in holding myself accountable and keeping myself in check. 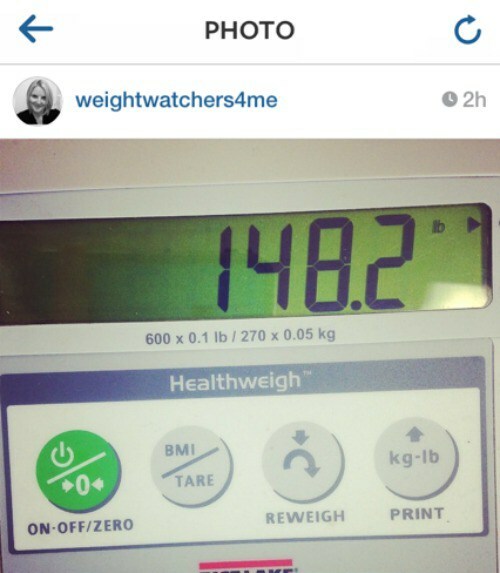 If you feel posting your weight would help keep you motivated then try joining in on the Instagram #weighins. 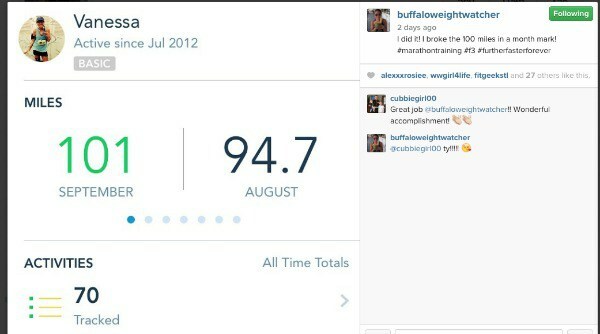 Many people use Instagram to track their exercise/activity progress. 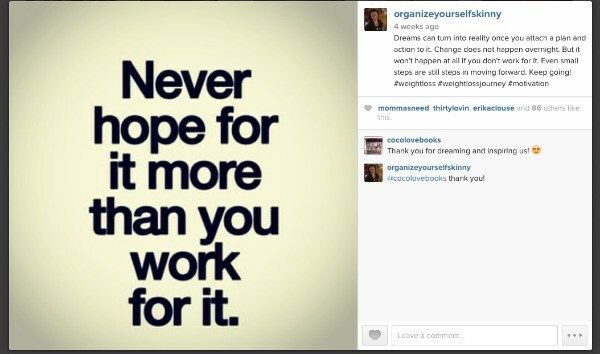 These posts are very motivational, especially when you see how far they have come. Creating a lifestyle change and losing weight is not easy. Some days are easier than others but we all know old habits die-hard. Having a group supporting and cheering you on can make all the difference between pushing hard or giving up. Finding like-minded people on Instagram is easy. I found people to follow using hashtags. Instagram is all about the hashtag. My favorite hashtags are #weightloss #weightlossjourney #cleaneating #healthylifestyle #freezercooking and ones like that. Basically, whatever topic you are interested in creating it into a hashtag. Type that into the search bar and see what comes up. 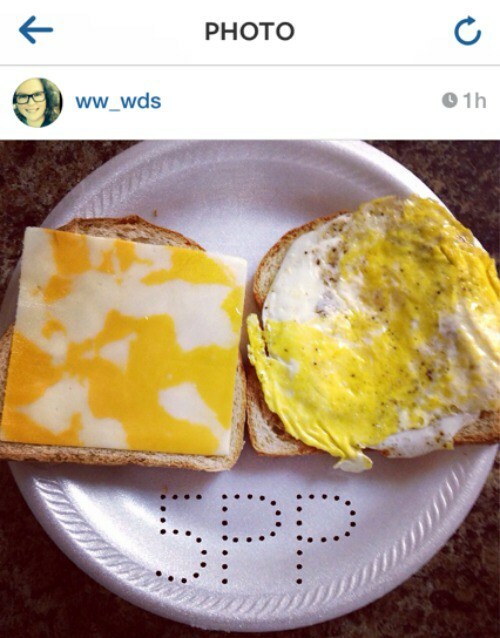 Weight watchers have a HUGE support community on Instagram. 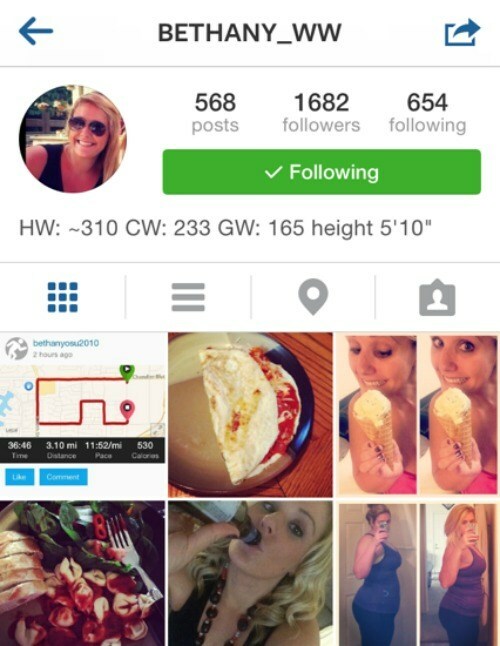 Most of the people I follow on Instagram use weight watchers and they are some of my favorite Instagrammers to follow. They post all their meals, weight watchers journal, and lots of inspirational quotes and pictures. 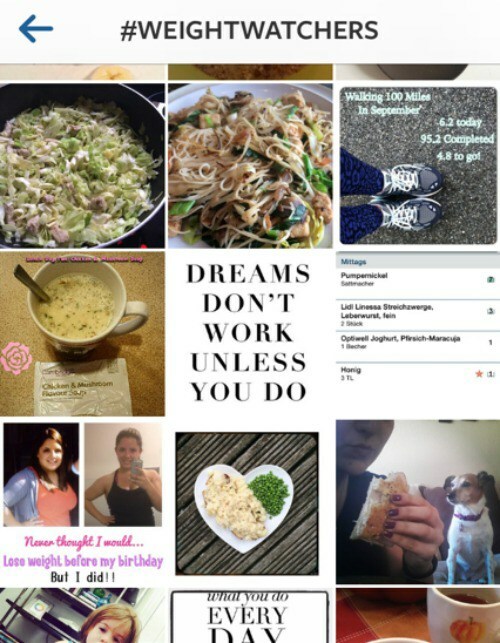 There are a ton of Weight Watchers hashtags but the ones I see the most are #weightwatchers #ww #weightwatchersjournal #weightwatcherspointsplus #weightwatchers360. 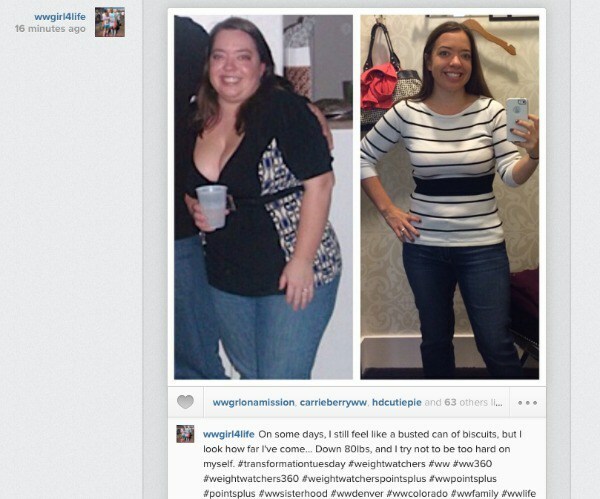 If you use Weight Watchers, or even if you don’t, I recommend following Weight Watchers Instagram folks. Another way I find people to follow on Instagram is to by commenting and staying active with other Instagrammers. A lot of my favorite bloggers are on Instagram so I follow their posts and meet lots of new people that way. People on Instagram are very supportive. Of course, you will always get that one negative nelly but for the most part, people are in the same boat as you and want to cheer you on. They want to see you succeed because they want to succeed. It is a great community to be part of. Staying motivated is hard. 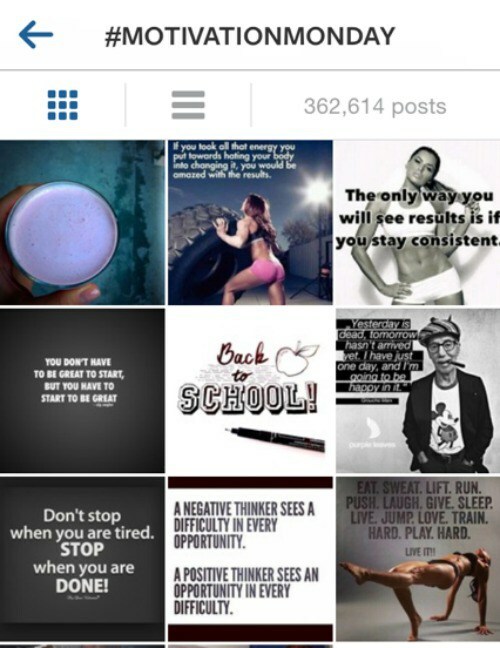 Instagram is filled with all kinds of motivation. I already pointed out the transformation and weigh in pics. Those serve as a huge source of motivation for people, including me. I also love motivational quotes. Sometimes the simplest of words can really resonate with me and keep me moving forward when I want to go back to bed. You can find all kinds of motivational quotes by using the hashtag #motivationmonday #exercisemotivation #weightlossmotivation or ones like it. However, it is not just the pictures that are motivation it is often the words behind the picture. I enjoy reading what people write their picture. That is how you get to know what inspires or motivates them. 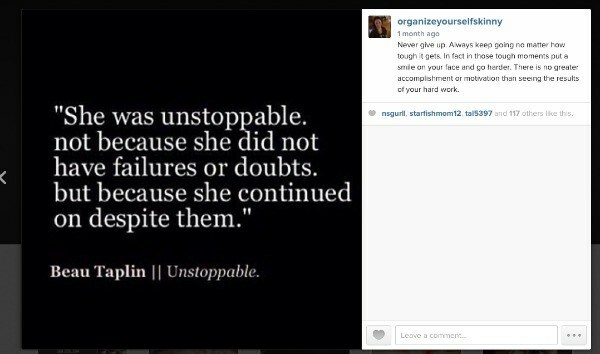 Here are a few of my favorite quotes I recently posted on Instagram. One struggle people have with losing weight is getting stuck in a rut. They eat the same things all the time and do the same exercise routine day in and day out. Nothing will throw a wrench into a healthy lifestyle like boredom and monotony. It is natural to want to try new things and evolve as a person. Over the summer one of my friends said “If you’re not moving forward then where are you going? Nowhere!” So simple yet such a strong statement. 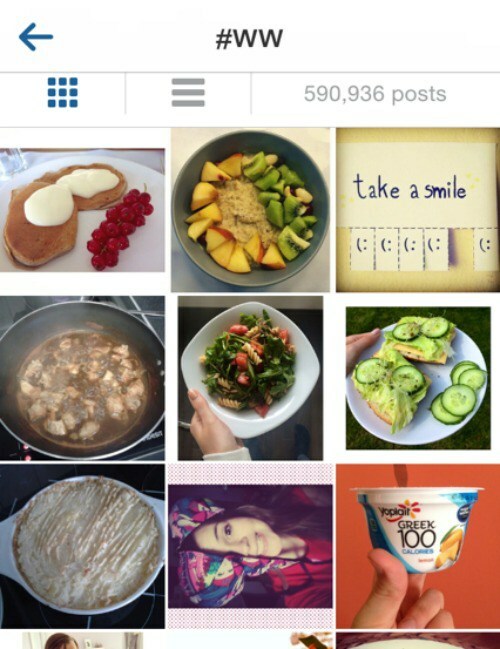 Instagram is like a healthy eating/exercise/weight loss idea factory. 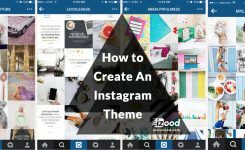 There are always Instagramers trying and sharing new recipes, showing off new exercise moves, sharing the latest product or ingredient they discovered, and lots more. Instagram keeps you a student. 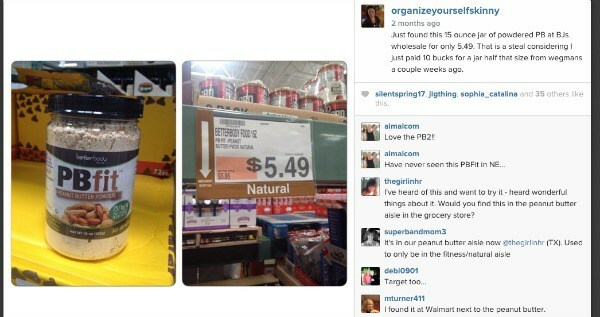 In this Instagram post, I shared a great deal on powdered peanut butter at my local warehouse store BJs. 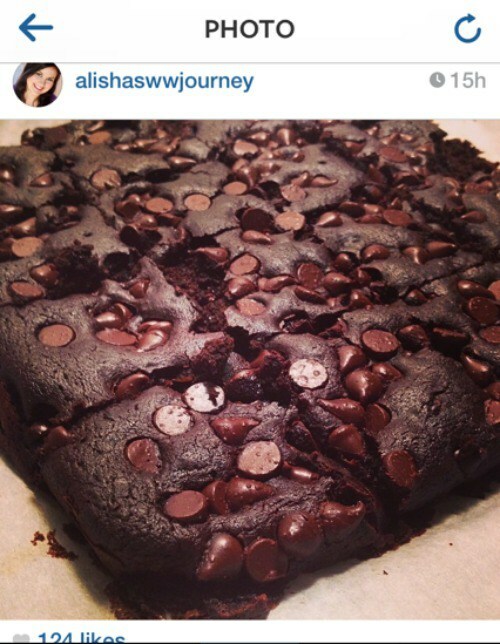 This Instagrammer shared a recipe she made from Skinny Taste. 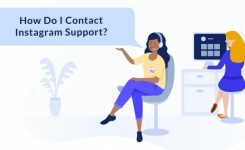 Instagram is a great way to share your weight loss journey, hold yourself accountable, learn from others, and join an amazing community of people that are working every day to build and sustain a healthy lifestyle.